The snow started later than anticipated for much of us last night but now appears to have arrived. We had a good idea that this storm would be nothing like our blizzard a couple weeks ago, but we didn’t expect it to dwindle out as much as it has. There are a couple of things we are seeing this morning that are working against this storm, keeping that in mind, we will still see snow accumulate with this thing, just probalby not quite as much. Despite the late start, we will see an increase in snow through the rest of the day. 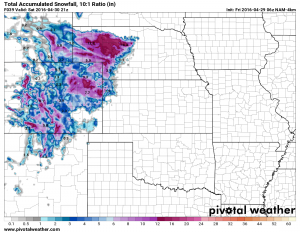 Snow showers along the Palmer Divide and areas South and East will have the best chance of accumulating snow. Temperatures will remain warm enough so that many areas at lower elevations won’t accumulate much. Due to the late start of the snow and the increased temperatures during the daytime, I’d expect most roads will remain wet in Castle Rock and points North. 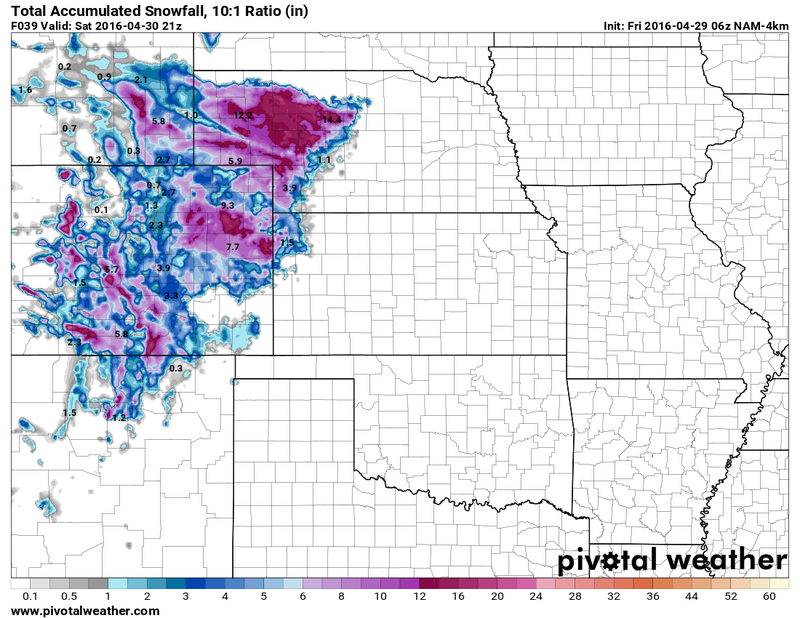 Points to the South (higher elevations of the Palmer Divide) may see some accumulation on roads. At this time, it looks like most areas will have minimal travel impacts from this storm, would not be surprised to see the Winter Weather Advisory cancelled early. In the forecast I’ve adjusted snow totals down slightly, there is still possibility totals hit the original forecast amount, but because of melting and compacting I don’t think those amounts will quite accumulate on the ground. Will remain mainly wet in lower elevation areas including Denver and Castle Rock. Some areas South of town in higher elevations may see some accumulation on streets, but overall travel impact with this storm is looking minimal. This storm has been very tricky to forecast, mainly because you have models telling you one thing, while mother nature is going another way. 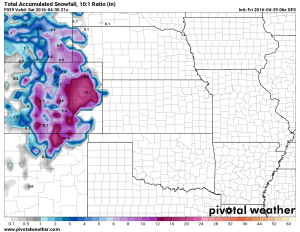 Even this morning, models are particularly bearish on snowfall, but we are noticing some issues with this storms ability to organize and create decent upslope. 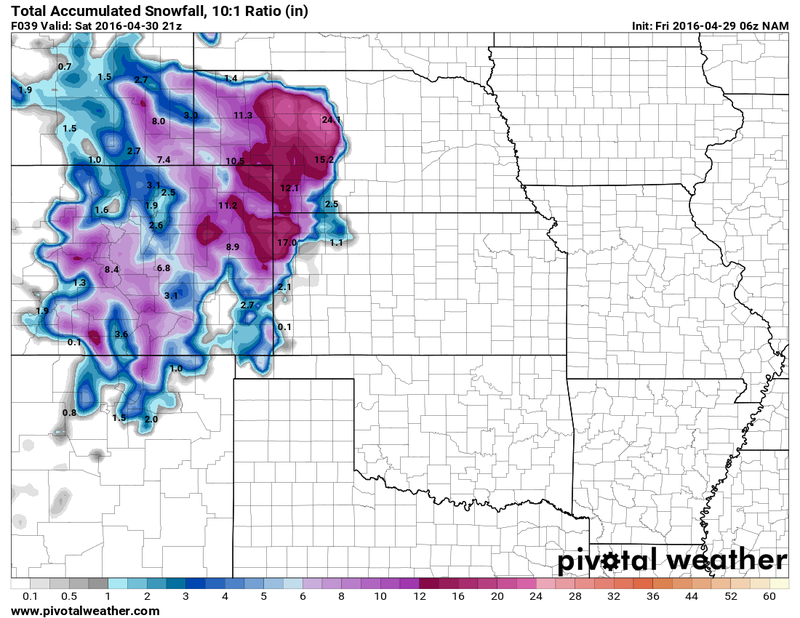 You’ll notice the NAM models have backed off of snowfall quite a bit from their runs yesterday. They also show a pronounced drier slot right along the front range foothills and Palmer Divide. This is a signal of downslope and could be a reason we had such a tough time getting snow going last night. All in all, I don’t think the models have a great grasp on temperatures as they have consistently predicted lower temperatures than what have been observed. This seems to be a struggle for computer modeling on these late season spring snow storms. The GOES sattellite image above shows the low and its associated energy. When the storm doesn’t organize well it has a hard time pulling moisture in from the Gulf and creating upslope along the front range of Colorado. 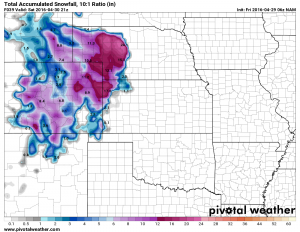 We saw hints of this last night and while its getting better organized now, it is moving off to the East quickly so the biggest impacts may be felt in Eastern Colorado and points further East. The last bit of data we can look at is what is called a Skew-T diagram. These are created by NWS offices launching a balloon every 12 hours, for Denver it is 6AM and 6PM. We can also look at models for forecasted Skew-T’s. These diagrams give us an excellent idea of what winds, temperature and moisture are like at different heights of the atmosphere. Temperatures at the surface are much warmer than originally forecast. This could be due to downsloping and the fact the atmosphere is so saturated. The more moisture in the atmosphere, the longer it takes to cool down. Weak and shallow upslope caused by weak winds out of the South-Southeast. 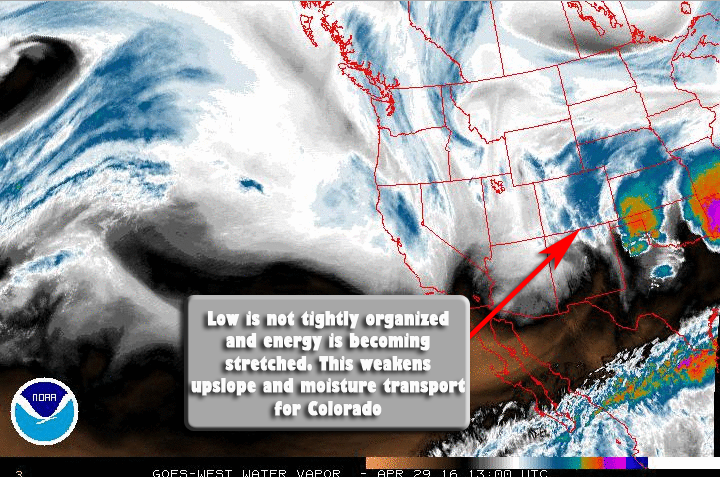 We need stronger upslope at the surface combined with better upslope higher in the atmosphere for good snowfall. So as you can see, there are quite a few things working against this storm to be a major snowfall producer. Latest modeling shows conditions getting better, but at this point the storm is beginning to move East. By loosing our snowfall last night and early this morning, we may not see the originally forecast totals. I’ll bee keeping an eye on this storm today and will have any updates or changes up on facebook or the website.